Presented at the ALA 2013 annual conference on Sunday at 1:00pm. "Project management is controlling the introduction of a desired change." From the UK institute on project management. This presentation didn't give me anything that was particularly applicable so, what follows is a bunch of ideas I came up with as I sat in the session. Side Note to self- ask Nini about DLDS sponsoring an ASTD workshop for the SDCs in MD to learn more about the program and the certification and its renewal. Or sponsoring an improv workshop from the group in Baltimore. Or sponsoring a Thiagi workshop on training games. Are there implications for any of these outside of this SDCs (anyone who gives presentations, improv for communication, or managers, etc?) that would warrant the regional sponsoring them directly? Side note to self: can Facebook be used as a project management tool? Prezi? Other freely available tools that are more social and transparent? Side note to self: ask for volunteers from the three counties to hear my staff development ideas so I can see if they are viable among the staff. Kinda like focus groups but call them something else that's more visual and meaningful. (The TLC approach. Talk to people) Maybe request audience during preschrduled meetings (branch staff meetings, etc). Presented at the ALA 2013 on Sunday at 10:30am. "The absurd can become fantastic!" Example: partnered with developers to build a library on the first floor of an apartment building. Zandra Campbell's food partnership in Baltimore was mentioned!!! Example: partner with park district/nps to put laminated kids books in local parks. 2. Look for the service gaps; has there been a service that has been eliminated or threatened? 4. Make partnerships a priority; include this in a strategic plan. 5. Don't forget yourselves; include your staff and library. Ask ourselves what do we offer? Practice tooting your own horns. Moresville, NC partnered with NASCAR to pay for staff development for the library. 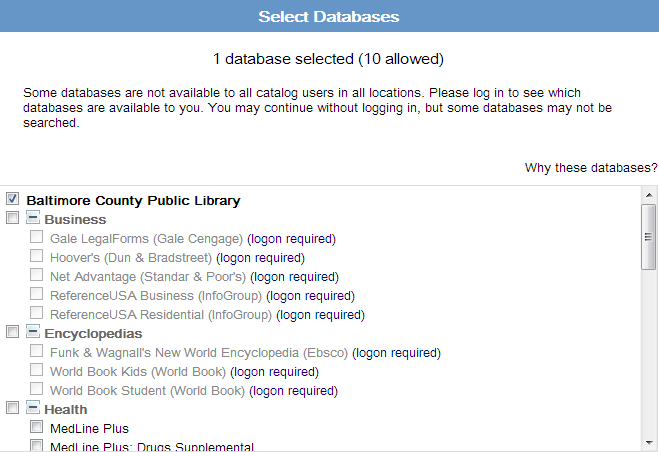 Why don't people use our library? They don't know why they should. What do we have or could we have to offer inside or outside our spaces? 1. Do your organizational values match? 2. Do we have common/complementary goals? 4. Are there complementary/complimenting strengths? 5. Are there other potential partnerships that we are overlooking? Read FastCompany magazine. Or their website. 1. Trust your partner. If you don't, then start small and build trust. 5. Be patient. It won't happen overnight nor without glitches. Slow down. Find a hole, come up with a goal, and then fill the hole. Is the program or project on target with libs mission and vision? Is there enthusiasm within the lib? Does the project support other lib department obj? Will it result in a lasting impact? Will we learn from this? Does it present professional development for staff? Presented at the ALA annual conference on Sunday at 8:30am. Who is in charge -- See RACI above. Make sure your goal is an end and not a means. Question: did any of you use any project management software or other technologies to help you keep track of things? - they sued Microsoft project and access. One guy chose not to use it because he felt like it would inhibit the transparency of the project. Tom's Planner - cheaper and easier to use than ms project. This program was presented at the American library association's annual conference in Chicago on Saturday the 29th. The are my raw notes to be edited and elaborated upon later. The slides can be found on SlideShare. I need to talk with these guys about problems/assumptions I have so I can be partnered with developers who want to create solutions and have the time to create solutions. Will Evans and Simon Marcus from The Library Corporation (TLC) were the actual speakers. Libraries have not changed that much in 2k years. "The failed because they built something no one wanted"
Culture of refinement vs a culture of exploration - refinement actually misses the best solution. Exploration finds a bunch of best solutions and once you find those best solutions then you refine (multiple hypothesis testing). Minimize the total time through the loop: ideas-prototype-build. 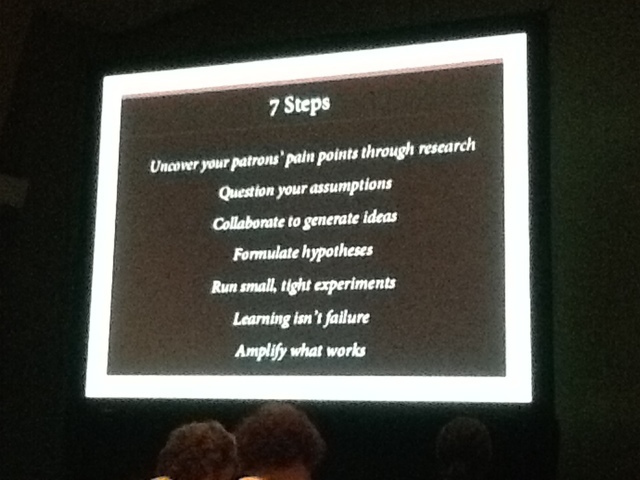 Marcia bates' berry picking model mirrors a lean start up rules. (When in an argument...) How much time could we all save if we just let the other guy have his way and subsequently proves himself wrong? 2. What pain points do they have? 3. How will we solve their pain points? 4. What is the most important thing they need? 5. What is our differentiation? Our real competitors are our early adopters who are solving their own problems on their own. Book: Who owns the future? Information is sing devalued. What is being valued is the monetization of information. And we are giving our stuff away for free. Lean startup machine - they have events and workshops. It's pretty cheap. One of the most valuable things the presenter ever went to. How do we make sense of the world so we can act in it? Dave Snowden. Karl Weick. Basically, you need to go through the social process of sense making as a team. Post it notes with ideas that are then cluttered or broken up into four groups of feasibility. Design thinking (IDEO). Develop a deep seated empathy for the people you're designing a solution for. Desirable, viability, feasible? Three overlapping constraints. The library homepage and PAC is not a main part of our customers' online life and that's a huge problem. Libraries need to be contributing valuable interactions in online spaces where their customers spend their time. The Customer Service workshop went over the keys to great customer service. The first goal is to make service a top priority. Attitude is another key to great customer service. Treat the patron as if they are your boss. The third key is to be consistent. The final key is to work as a team. Look good in front of your customers. "Give 'em the pickle!" has always been my customer service style, although I had never thought of it in terms of food. Breaking customer service down to the four areas: Service, Attitude, Consistency, and Teamwork is a useful way of analyzing one's service philosophy and practices.The exercise of identifying pickles from the library and from individuals was interesting- it was easier to identify pickles from the library. 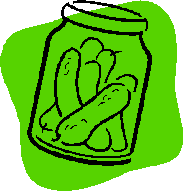 I want to work on our consistency within the branch by identifying our pickles and making sure we are all offering them. A few other suggestions I picked up include offering laptops and eReaders for inhouse use, which I hope to implement in the near future. This was another great workshop offered by WMRL, and I highly recommend it. One of the best pieces of advice I took from this workshop (I found myself using this over and over this week) was telling myself "I like this person! I am going to make this person happy." instead of giving in to my normal internal groan when people walked up to the desk. (It's been a tough week). But tonight I am serving up lots of pickles-sweet and dill- as part of our Teens-After-Hours Hobbit feast! And I know they are appreciated! Give A Pickle, Get A Smile! You are the face of your company/organization. Teamwork…group of people who go out of their way to make each other look good. Have the courage to make things right. Andre Jones was an effective speaker presenting on the topic of performance reviews. The presentation gave me a lot to think about in terms of how we facilitate our reviews at the branch. The branches are already in the process of revamping our evaluations so this training could not have come at a better time. It was also refreshing to know that I was already ahead of the game when it came to completing reviews as we’ve already written branch expectations, went over job descriptions, etc. Since the training, I have listed out all staff goals and plan to review them quarterly. I hope to implement a new monthly special activity sheet that includes a section where goals are listed, so that employees will be reminded of their goals on a monthly basis. An employee’s review is coming up in July so I hope to practice some of the new techniques I have learned, such as: filling out the review with the employee, choosing goals to help them exceed current performance, and using effective words in the review. While attending MLA, I attended the trainings listed below. If you want more information, please contact me and I would love to talk more about them (mfoltz@washcolibrary.org). - FOCUS ON GENRES – We learned how to narrow down titles into sub-genres (not just a mystery but a cozy mystery). The trainers provided websites for Reader’s Advisory that could be very useful, Bill Taylor, wrote a wonderful blog post on this topic already. Please refer to Bill’s entry for more information. I hope to apply my new genre knowledge to RA services. - SCVNGR Hunt – The presenters went over how to set up a scavenger hunt through the SCVNGR program. They demonstrated how it can be used by planning a SCVNGR hunt that we could do in the conference center. They liked the app but it had limitations: only 5 spots could be used per SCVNGR (free version) and the statistics were unreliable. They suggested other scavenger hunt apps that could be used but there wasn’t a clear leader scavenger hunt apps, it’s whichever app would work best for your situation. Although I wouldn’t run this app for a scavenger hunt, I learned that there are apps out there to help facilitate these adventures. - Speed Mentoring – I got to talk with other librarians about their backgrounds and was given advice on my career. I purposely chose to mingle with other branch managers but they were in larger systems so our experiences weren’t very comparable. I did benefit from this training my making new contacts and being inspired to keep searching for a mentor. - STEM Discovery Programming – This session was split into 4 stations: (1) Scribbler machine, (2) Makey Makey, (3) Tweens/Teens programming, and (4) Children’s programming. I got to play with a Makey Makey, I learned from Jeff that we have these in the system. I LOVED the scribbler machine, you can program it to move and then put a pen in the top so kids can use it to draw shapes on the floor. I could see my teens at Boonsboro loving this! (http://www.parallax.com/tabid/455/Default.aspx) The Tweens/Teens program focused on science with, which seemed to me, science fair projects that were cheap & easy for kids to do. (I have a handout if anyone is interested!) The Children’s programming station was very basics on things we do now – reading children’s book and then having hands on learning/counting/etc. 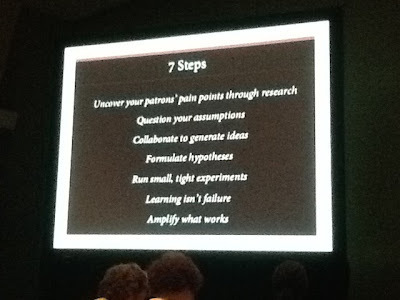 I’ve been looking into these ideas for STEM programming since I have returned from the conference. - Mad about Libraries – the founder of Mad magazine talked about censorship in libraries. This presentation was an open discussion of how different systems deal with censorship issues – graphic novels, internet usage, etc. It was interesting to hear other’s opinions on these issues. - Radical Customer Service – was a big conversation regarding what MD libraries are doing to provide great customer service. It was nice to hear what other counties were (and were not) doing in customer service and why. I learned from the training to keep questioning “Why” when given (or taken) a no answer from anyone. - Graphic Novel collection building – was a local comic book shop owner who came in and presented a history of comic books/graphic novels, what we should have in stock, and why graphic novels are important. The handouts from this presentation were very useful (I’ve already lent the notes to another staff member but if you want to see them, please let me know.) I hope to be able to look into graphic collections more and recommend some titles. I hope that if WCFL develops an adult graphic novel collection that I will be a resource for them. Although, I still need more knowledge in this area as it is ALL new to me. - The closing luncheon was a presentation called Access Schmaccess by Eli Neiburger. He was a very effective presenter and had my attention the entire time. His longer presentation is available online (I hope to have time to watch it again - http://webcast.gigtv.com.au/Mediasite/Play/1e065b11e6924a0a908cebb76d7917c71d ). His view of the futures of libraries is that we will be the center of the community and evolve to offer things (telescopes, etc.) and not just books. He thought libraries should become places where people create (Makers Spaces??) their own content (sound studios, movies, etc.). He seems to be an up and coming voice in the library world so it’s beneficial to be aware of his message. I attended Andre Jones workshop on Conducting Effective Performance Reviews. I thought Andre Jones did an excellent job explaining and demonstrating how to write and deliver a performance review. I feel as though following his guidelines, I will be able to give a performance appraisal that will really reflect my co-workers performance. The Maryland Statewide Staff Development Coordinators team exists to provide a framework for effective and efficient collaboration of statewide staff development projects and programs, and to share staff development experiences and resources. We are staff development coordinators from Maryland's public and regional libraries. We serve the staff and patrons of Maryland's public libraries under the auspice of the Division of Library Development and Services. We also shortened the operations document that accompanies the charter. Once the final document as been reviewed and approved by Nini Beegan, I'll share it here. Conference Sharing: This group is tasked with providing an outlet for staff across the state to share what they've learned at conferences that they've attended and ideas for how they might use what they've learned within their library systems. This group has offered 3 online conference sharing events to date and we have 2 more on the calendar. We hope to offer 4 events per year and we'd also love to see others (library systems, MLA divisions, etc) adopt this conference sharing model themselves and offer them statewide - hint, hint. Book Expo America: June 19th at 10am: if you're attending BEA and want to share your experience and if you aren't attending but want to hear what BEA was all about, please click on the first link to register! Masie's Learning 2013: November 21st at 10am: registration will be available later. Staff Development Presenters/Trainers Master List: Sam Eddington (ESRL), Jennifer Hopwood (SMRLA), Lisa Kenyon (EPFL), and I (WMRL) will create a pilot master list of the staff development presenters and trainers we've had over the past year or two that includes the presenters' names, contact info, websites, topics, whether or not we'd hire them again, etc. Sam will create the document and share it via Google Drive and then the four of us will populate it. We'll share it with the other SDCs and if it looks like this is something others would want to add to then, we'll share it with the SDCs who are interested in contributing. Maybe we could possibly add it to the MERLIN site and/or staff development wiki? Creating a Culture of Learning Unconference: So, the SDCs were hoping to walk out of the meeting yesterday with one project that all of us could work on that would benefit the whole state of Maryland. We started to run out of time so, the only suggestion that was made was for us to host one or two unconferences on the topic of "Creating a Culture of Learning." And that was about it. We talked about maybe having 2 separate unconferences - one for supervisors/managers/directors and one for non-supervisory staff. One of the main concerns that bubbled up from this idea is the observation that staff who do not need to earn CEUs are less likely to have learning in the forefront of their minds as they go about their jobs. They're less likely to ask for training or even want to attend training and we would like to see this be different - we would love to see all staff in our libraries have learning at the forefront and be enthusiastic about attending training, even feeling empowered to look for training and requesting it on their own. So, we don't have a date or any other details beyond that so, the group will keep thinking about how we can approach this and go from there. if you're reading this and you have thoughts, ideas to share please do so in the comments section or email me directly. The Maryland Statewide Staff Development Coordinators meeting is held twice a year for the purposes of getting the staff development/training coordinators from all the public and regional libraries across the state in the same room to work on learning projects, hear from statewide agencies with whom we work closely, to share experiences, etc. The following are my notes from the Statewide Organizations' reports. Dennis Nagle from the Division of Library Development and Services reports that they are almost at full staff. They're close to selecting an LSTA Grants Coordinator. DLDS is working diligently on developing a social media presence and the Maryland State Dept. of Education has hired a social media consultant to assist with this endeavor. Susan Paznekas from the Division of Library Development and Services reported that they've hired a new certification officer - whose name I did not catch but she'll share it out with all the SDCs once he/she gets settled. Also, if you have staff who are getting certified for the first time - or if you have staff who are renewing for the first time (or if you happen to be one of these staff members) through the MSDE website, this PDF shows you how to do this. Jay Bansbach from the Maryland State Department of Education reported on Common Core updates and the public library response. I will share his slides and data as soon as I receive it from Nini Beegan. There is a new STEM coordinator - George Newberry. MSDE is in the process of hiring a 2nd STEM Coordinator. There is a big push, under the common core initiative, for schools to really push library database usage - and more importantly, to get students to identify databases as portals to "sources of evidence." Nini Beegan from the Division of Library Development Services reported that she is waiting to here back from MEEC (I forget what this stands for) regarding SkillSoft pricing. She'll know more by the end of June. It's possible we may have to go to a seat-based license to accommodate the budget. She also reported that there is a new space on the MERLIN website where we can share and access recordings of webinars that we've created in Blackboard Collaborate or other archived online trainings from other sources. Nini assembled a team of three SDCs will will be reviewing and revising the MERLIN website to make it more user friendly in order to increase its usage by the SDCs and statewide staff in general. Margaret Carty, the Executive Director of the Maryland Library Association shared very encouraging statistics from the annual conference (i.e. close to 700 attendees!) and she announced that several of the conference programs were recorded and are being made available for folks to watch via the MLA website. *NOTE* You must watch the videos in Internet Explorer. *ANOTHER NOTE* Yes, the videos have been approved for CEUs - but always talk with your staff development coordinator first! Right now there are only 3 or 4 videos available but check back frequently as new videos are always being added! Helen Blumburg from the State Library Resource Center in Baltimore, reports that SLRC is underway with its 5 year renovation plan. The twice-per-month webinars will continue and have been very well attended. The next SLRC conference will be October 16. The SLRC website will also be getting renovated. Gail Griffith reports that the next Library Associate Training Institute will be from August 28 - Dec. 13. The new class of LATIs will receive onboarding information later this week/early next week. They've scheduled LATI Learn How To Learn Online classes which will be open to everyone if there is space after the LATI students register. The dates to mark on your calendars are July 23 and July 25 - 10am and 2pm. I thoroughly enjoyed this presentation—I found Mr. Jones using WCFL's evaluation form and scoring system practical and quite useful. I, too, found the suggestion of making quarterly check-ins a habit good advice. If nothing else was impressed upon me during the presentation, it was that solid documentation is the friend of both the giver and receiver of a performance review. Preparing throughout the year by noting positive and negative employee conduct can cast a better light on any “burning images” that may unfairly temper our judgment. I feel I benefited greatly from this training and gained some real insight on the evaluation process. MD PUG met on Thursday, May 30th at Chesapeake College. The following post will share some reminders as well as some products/enhancements that are on the horizon. The next MD PUG meeting will be at the new Hagerstown library! The date of which is TBD. is the main site for Polaris ILS. Is the extranet for Polaris users. WCFL/WMRL - contact whomever we hire for Carrie's position, or Julie, or Tracy for your staff username and password. Come here for: 1) more webinars, 2) marketing materials, 3) news and events, 4) help in general. Shows you what other libraries have done to customize their PAC from vanilla out-of-the-box set-ups to PACs that are extremely customized down to the very last material icon. See what your PAC could be. Browser-based staff interface. Baltimore County Public Library is currently testing this. If implemented, staff could potentially provide roving, mobile check outs and other staff-client based services on tablets or other hand-held devices. Exciting!! Fusion: integrates digital collections into the PAC. BCPL is currently using this product with the help of volunteers who enter the images, their titles, and their descriptions. Check it out. 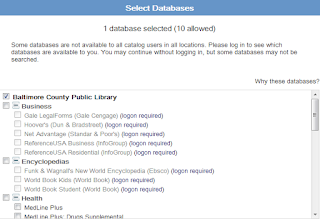 Unless you have a BCPL card, all you'll be able to do is click on the Selected Databases link beneath the search box to see which databases you could be searching all at once. Basically, this feature let's the user search up to 10 electronic resources at once. Doing a science paper? Search the catalog for books at the same time you search EBSCO's Science Resource Center for news and journal articles, and your favorite online encyclopedia for an encyclopedia article!